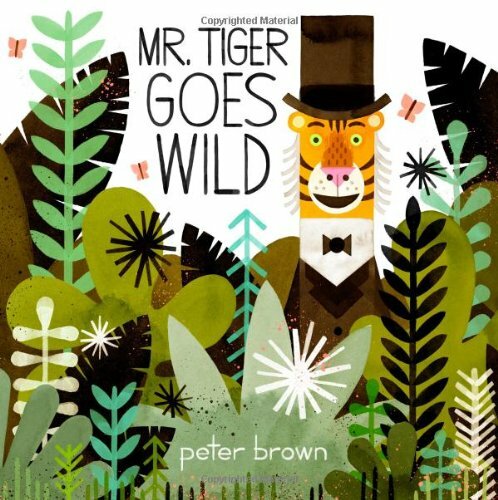 Mr. Tiger Goes Wild opens to muted tones of a proper Victorian society of well-mannered animals, living in houses and walking on two legs. Surrounded by an abundance of subdued suits, ties, dresses and tea, the daily hum-drum pushes Mr. Tiger outside the city limits to a place where he can ROAR! But first he undergoes the drama and surprising silliness of life on four legs, a swim in the water fountain and *gasp* a view of his magnificent, naked self. Confident artistic elements start on the decorative endpapers, capitalize on the freedom of double page illustrations, built intensity with the color palette, and combine seamlessly with the lean text of most carefully selected words. With great comedic timing and a light-handed touch on message, Peter Brown has written a clever, compelling invitation to self-discovery. Congratulations to all the Cybils winners! Well, I congratulate the award recipients and wish more people would get lucky.